Pineapple plants are one of my favorite plants to grow! Be warned, however, growing a pineapple plant can take time. A replanted pineapple will take a minimum of two years before it begins to flower and fruit. Once it does, you’ll be blessed with delicious fruits that you can replant again and again! I highly suggest choosing an organic pineapple because it’s hard to know exactly what chemicals (and what they might do) are on conventional produce. Organic ensures that your plant will be healthy and non-GMO. Look for a pineapple with vibrant colors and firm flesh. The leaves should be green and firm. If possible, shine a light into the center of the leaves to make sure they look fresh and bright, since dead pineapples will begin to decompose from the center of this leaf system. Holding the top leaves firmly in one hand and the pineapple fruit in the other, gently twist off the top. It should come out cleanly. Be careful not to force it or rip it. Chop up the rest of the pineapple fruit and snack on it while you do this next part. The top of the pineapple will consist of the leaf cluster, and a small fleshy bit of fruit. Starting at the very bottom of the leaf system, gently pull off the leaves until about a quarter of an inch of them have been pulled away from the stalk. Take a minute to examine the leaf system now. You will notice a division between the base where it was severed from the fruit and the section of stalk with the leaves cleaned. With a sharp knife, gently cut along this line, being careful not to crush the leaves. Using a vase or a glass jar wide enough to give the stalk some room, but narrow enough for the leaves to hold the stalk off the bottom, place the stalk inside and fill just to the top of the clean portion of the stalk. Place in a sunny window and check daily to keep the water level consistent. Some people plant the stalk directly in soil with success, but I’ve had the best luck sprouting my pineapple in a jar of water. Within a few days you should begin to see root buds at the base of the stalk. , with an acidic pH of 4.5-6.5. You can also plant directly in the ground in moderate climates. Pineapples don’t like tons of water, so be careful not to soak too much, and water over the top of the plant. The plants can get quite large, so be sure to give it plenty on space. In colder climates, move plants indoors, preferably to a south-facing window with at least 6 hours of direct sunlight daily. As soon as temperatures warm up, you can transfer the pot outside. Pineapple plants do well outside, planted directly in the ground, in USDA hardiness zones 11-12. Again, be sure your plant is in a location with at least 6 hours of direct sunlight per day. Healthy pineapple plants will flower a few times at approximately 2 year intervals. During this time, however, your pineapple plant may produce suckers. You can remove and replant these into additional fruit bearing plants. Enjoy fresh pineapples from your garden for years to come! Kitchen Scrap Garden is an ongoing Make Ad Lib series where I show you how to replant kitchen scraps in your garden. It’s a fantastic way to save money, prevent waste and grow your own food, while also feeling like a green-thumb badass. If you try these Kitchen Scrap Garden: Growing Pineapple tips, I’d love to hear what you think!! Please leave a comment below or instagram with the hashtag #makeadlib . 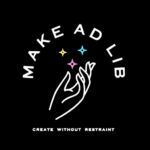 Don’t forget to tag @makeadlib so I can see your feedback!